My Scrambled Style: Trend | Emerald green! Gepost door My Scrambled Style op 2:44 p.m.
so excited emerald green is the it color of 2013!!!! Me too. It is such a pretty color :-). That's a very good color for me! Awesome color. Really love it! That first skirt is absolutely gorgeous! Such a great colour-I love the way Poppy Delvigne wears an oversized green blazer!! gorgeous post, such a great inspiration! wow!! Love this color, very much!!! Oehh jaa, helemaal mijn kleur! Heb n emerald skibroek!! I love this color and your selection!!! OMG! Emerald green is my favorite color! Wow, the skirt in the first photo is just gorgeous!! I love the green coat in the second picture as well. I have that pleated American Apparel skirt! Anyway, great blog, would you like to follow each other? Love that green trend! Thx for post! 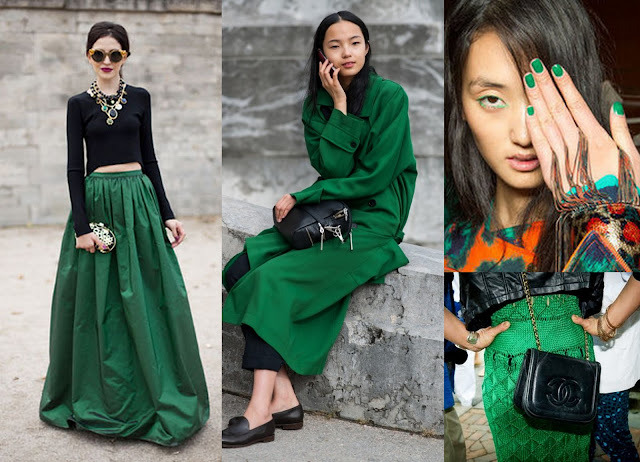 I'm really loving the emerald green trend, it compliments almost every skin tone. i love the emerald green !!! amazing pics.